The Xamarin.Forms ComboBox control allows users to type a value or choose an option from a list. Supports data binding, auto-suggestion, multiple selection, tokens, header and footer view and more. 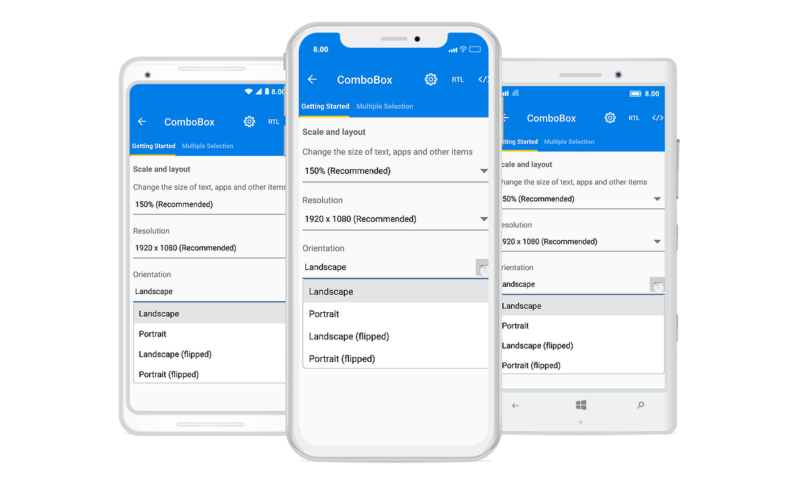 The Xamarin.Forms ComboBox control, or drop-down, is a text box component that allows users to type a value or choose an option from a list of predefined options. It has several out-of-the-box features, such as data binding, filtering, UI customization, and custom templates. In editable mode, the Xamarin.Forms ComboBox control allows users to edit in the text box, and suggestions are shown in a drop-down list based on the input. Non-editable mode prevents users from typing and selecting items from the drop-down list. The Xamarin.Forms ComboBox control suggests a list of filtered items in a pop-up or autofill the rest of the suggested word in the input area. The appearance of the Xamarin.Forms ComboBox is highly customizable. Template support - Apply custom templates for the items in the suggestion pop-up to change their appearance and also add more information. Header and footer template - You can design your own header and footer for the pop-up list using the header and footer template. Custom view in text area - The Xamarin.Forms ComboBox control accepts any custom view in place of the text box. Colors - Customize the color of all the elements of ComboBox to match your app theme. Font - Customize the font size with pixel precision or with standard options such as small, medium, and large. Also, apply custom fonts and font icons to enhance the appearance.